Melon and Pandan Jelly Dessert. Nam Varn Mak Taeng Kup Khao Lod Chong ( ນ້ຳຫວານໝາກແຕງ ກັບ ເຂົ້າລອດຈອງ; ເຂົ້າລອດຊ່ອງ ) in Vientiane, Laos. 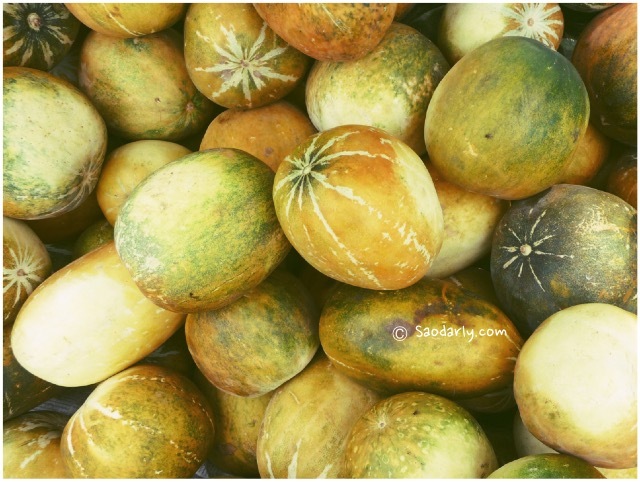 During the month of April, there are plenty of sweet melons and watermelons available at the local market, roadside stands, or booths at the temples during Boun Pi Mai Lao celebrations. My aunt bought a few sweet melons from the local temple she visited during the bathing ceremony of the Buddha stupas. 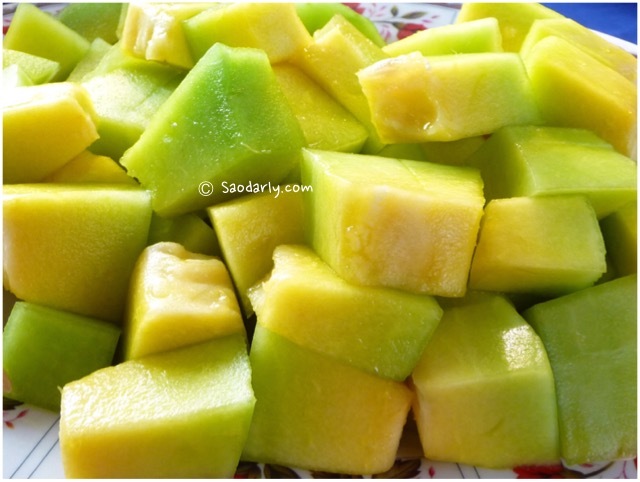 The melon is sweet enough by itself and makes an even more delicious dessert when mix with Khao Lod Chong ( ເຂົ້າລອດຈອງ ) or Khao Lod Shong ( ເຂົ້າລອດຊ່ອງ ). 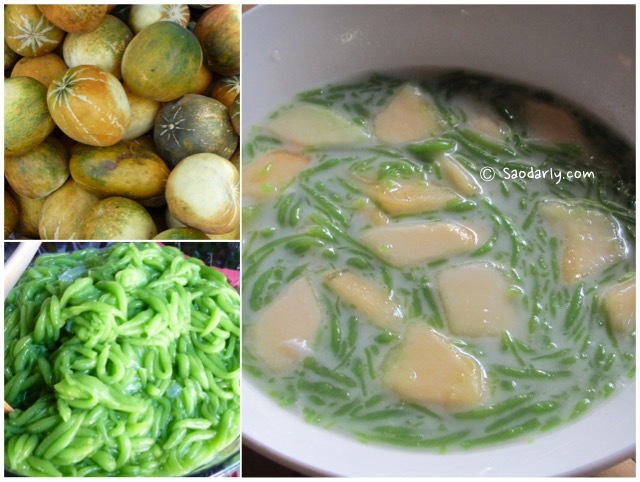 Can you please tell me the easiest way to make the pandan jelly ? Thanks …. 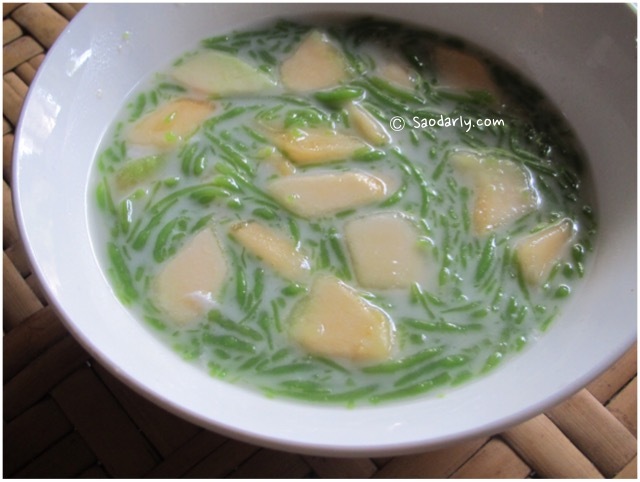 If you live in an area with many Asian grocery stores, you can find an instant pandan jelly mix with easy to follow instructions on how to cook make it. Many Lao/Thai grocery stores even sell the homemade one for a dollar per cup. 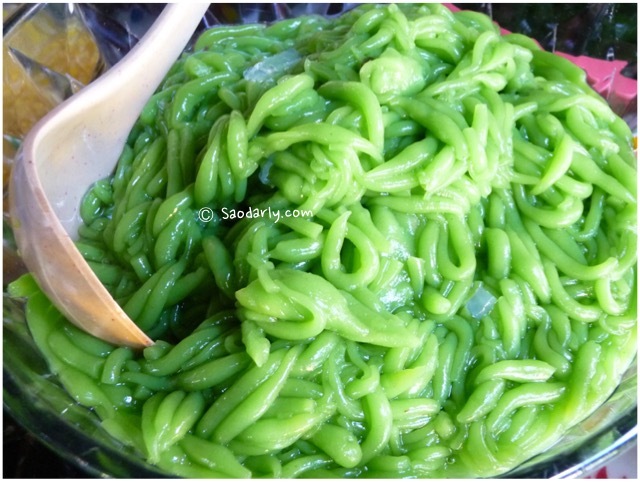 You can also order the pandan jelly mix online and try it out. I don’t know how to make this myself. I bought a Lod Chong mix once from a Chinese grocery store to try out. It’s nothing compare to the freshly made kind you can find in Laos or Thailand but it satisfied my craving until I can go to Laos for the real deal.